The Rosebrier Crime watch was started in 1984, “by Dawne Gilchrist and two other founding members and me” said Tully Johnson. The Rosebrier Crime Watch covers the S.E. portion of Division One in the County of Wetaskiwin, bordering on Ponoka, Camrose, Highway13 and Wetaskiwin. 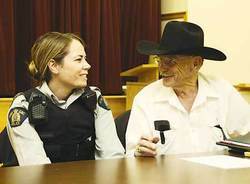 They are a member of the Alberta Provincial Rural Crime Watch Association that, “will strive to promote rural crime prevention through communication, programs and fund raising.” There are 57 Crime Watch Associations in Alberta with 7500 crime watch members. Tully and the RCMP liaison officers stressed the value of participation of the local residents and also stressed the importance of taking more caution. Take your keys out of vehicles and equipment; lock them; don’t provide easy access to contents such as tools and other items that are easy to pawn; leave your lights on at night; don’t leave guns in barns even if they are in locked cabinets. Tully stressed the importance of the residents being the ‘eyes and ears’ of the RCMP. For $20, members receive a 5 year membership and a gate sign. They also receive a numbered identification card that coincides with their application and has been approved and recorded by the RCMP. Residents can join the Rural Crime Watch by contacting Tully at (780) 352 0612 or by going to the Wetaskiwin RCMP detachment and filling out an application form.